So, you are planning to bring home a new puppy? Whether your new furry family member is coming from a breeder or a pet shop or a street corner, the first night can be a big challenge. Here are some useful tips to handle your young four-legged kid on his first night at your home. Your puppy has spent his initial days with his mother and siblings, staying warm and comfortable in their company. Moving to a new home requires major adjustment and separation anxiety will be common for a while, especially on the first night when everybody is sleeping and he is left alone, or at least, in silence. Before the night comes, make sure that your house is dog-proof. This aspect should be planned in advance. Potted plants, food items, electric cables, and anything else in your house shouldn’t be able to access by the puppy—all must be kept on higher levels from the floor. Hazardous items that he can chew should not be on the floor. During the first night, it is also advisable to close off rooms. This way, your puppy cannot wander in and chew objects or perform his toilet in an incorrect location. Also, keep your shoes and clothes away because puppies tend to chew anything and that can lead to health complications for him. Prior to bed time, let your puppy explore his new home. Do not leave him alone yet. Instead, follow him while occasionally petting and speaking to him. 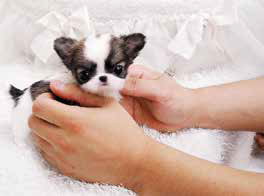 These gestures help make the puppy feel at ease and get used to your company. In fact, activity before bed time is preferable to let your young dog take a nap because the chances are that a worn out puppy will sleep better than the one who has been lethargic all day. A new puppy may certainly cry during the first night in his new home, but being tired can decrease the chances of uninterrupted sleep for both the dog and his pet parent. Another way to prepare your puppy for a good first night is to stop his food intake an hour before bedtime. Going to bed with a full stomach and bladder can mean more than one nocturnal trip to the designated area. But remember that your new family member is like a human baby in many ways and will need some time to know when and where it is right to relieve. Therefore, be prepared for at least one trip during the first night. Just as human beings experience anxiety in a new place, your puppy will be anxious on his first night. Sue Raimond, pioneer of harp enrichment therapy for pets, says that music can sooth a nervous animal with high stress levels, leading to relaxation or even sleep. So, why not play some soft music for your puppy? Another way to make your puppy feel more comfortable is by putting a hot water bottle wrapped with a towel in his bed. The warmth can cause ease. Some pups relax if they have a ticking clock in their crate or basket. This should be wrapped in a towel. If your pet had any bedding before he joined you, a piece of that cloth can be reassuring as well. Once your pet and you are ready for bed, check the area where you’ve placed his basket or crate. Ideally, your puppy should sleep in your room the first night and a few more nights too. Consider the foot of the bed or a side. Ensure that the area is warm and free of draughts. Do not let your dog share your bed with you on the first night if you do not plan to let him sleep there in the long term. 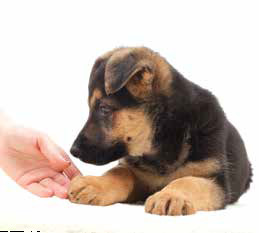 Allowing certain behaviours and then forbidding it later on can be detrimental to the puppy’s future in the form of behavioural problems. A bit of petting and some reassuring words later, your puppy is ready to sleep. Unfortunately, whining or crying is very likely to occur. The appropriate approach is patience and calmness. You should put him on his leash and take him out to for relief. Once the job is over, return your puppy to his sleeping spot. Do not play with him as this will make him think it is normal to play during the night. Another mistake that pet parents often make is to move a crying puppy far from their own sleeping area. Placing your dog in a cage is another bad option that many resort to in order to stop him from scratching doors or running around. These negative responses increase the new resident’s insecurity and lead to louder and more desperate whining. Adapting the opposite kind of approach can have damaging effects as well. When your puppy is whining in the middle of the night, do not react like an overprotective caregiver who ends up making a mountain out of a mole hill. In other words, do not sit there coaxing your puppy and speaking in a soothing tone, repeating, “Poor doggie, it’ll be alright.” Remember, you need to give your pet the feeling that nothing is wrong. He needs to know that he is worrying about nothing at all. Think about the first night with an eye on research that has always pointed to dogs as pack animals. A puppy is separated from his pack and brought into a new pack. Just like humans pass on feelings, emotions, and moods to each other, the leader of the pack (you) needs to be careful about what you pass on. So, be confident and positive and never lose your cool. Once you get through the first night, you’ll have years of unforgettable companionship. Food items to be avoided for your pooch Wake Up Kerala! Wake up to the apathy of stray dogs!